Add the prawns and onion to a large container. Squeeze the lemon juice out of the lemons and pour of the prawns and onions, let marinate for 1 hour. In the meantime, prepare the rest of the ingredients and have them ready to go when the prawns are done. After the prawns have marinated for an hour, mix the ingredients together and season with the spicy sauce, salt and pepper. Let sit in the fridge for an hour or until you’re ready to serve. You can use 1 or 2 minced jalapeños instead of the salt. You can also add avocado if you like. You can add other kinds of seafood, but they should be cooked if you buy the prawns cooked. If they’re raw, simply dice them and add them to the mixture. 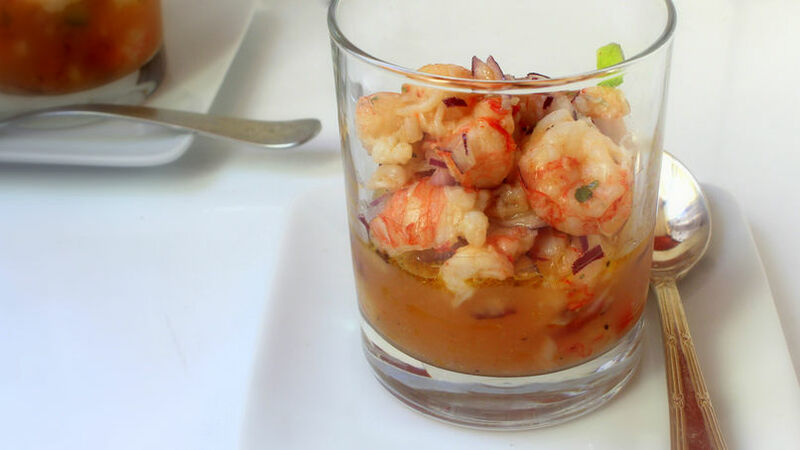 If you’ve never tried a prawn cocktail, but love seafood, then this is a great opportunity for you to try it out. It’s easy to prepare since you can find precooked prawn, but you can also prepare fresh prawns by boiling them for 1 or 2 minutes. Prawns are crustacean that have flavor and texture similar to shrimp or lobster. You can prepare them in garlic, with rice, grilled or in a salad.